A King makes a promise to his dying wife to marry only someone with her golden hair. The King finds his eyes are turned by his maturing daughter's beauty. 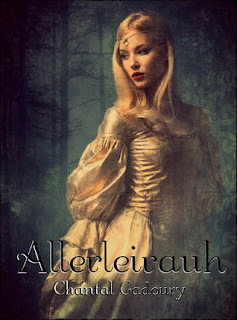 Realizing her father's intentions, Princess Aurelia decides to sacrifice her life and escapes the Kingdom disguised in a cloak of a thousand furs. Aurelia enters the Kingdom of Saarland der Licht and is taken under the wing of Prince Klaus. Aurelia must face herself and her fears in her journey of self discovery. There are two parts to Allerleirauh. The first half of the book is called, "The King and His Promise" and takes place while Aurelia is still in her home land called, "The Kingdom of Tranen". The second half is called, "The Girl and Her Coat" and takes place in "The Kingdom of Saarland Der Licht" after Aurelia runs away. I am sure I am not the first person to say that I did not like the first half of the book. It wasn't because of the writing, it wasn't because of character development, but because of the events that take place in The Kingdom of Tranen. Aurelia's father, the King, goes Mad. Before his wife dies he promises to never marry again unless she has his late wife's golden hair. The King must marry again, because Aurelia is his only heir and he needs a son to pass his crown down to (Because god forbid a woman take over lol). He goes through almost every woman with Golden hair in the world to try and find his new Queen, but never succeeds. That is until he begins to notice his own daughter. As you can imagine awful things happen in the first half of the book. And before I say this, don't think I am blaming the victim, because trust me her father is completely to blame, but I just didn't enjoy Aurelia's naivety. He suddenly started acting weird, he gave her gifts and attention that she never got from her Father before. People told her to be careful and she heard others talking when they didn't think she was around about how inappropriate her Father was being. I'm not in any way saying it was her fault or that she "had it coming", but I just wanted her to be smarter and not so naive about the whole thing. There wasn't anything she could have done to avoid what happened to her, because I am sure her Father would have just come to her chambers or find some other place or way to be completely disgusting. The second half, I enjoyed a lot more. Aurelia has escaped the castle and has turned into "Allerleirauh". She comes to The Kingdom of Saarland Der Licht and meets a very nice and handsome Prince who swears to protect her and give her anything she needs. I really enjoyed this half of the book, because it is where Aurelia finally learns who she is. She becomes bold, brazen, and finds trust and love. There was only one part in the second half that I didn't like and that was the character of Crestwood. He just didn't make any sense to me. He was extremely distrusting and cautious of Aurelia when she comes to the castle. He continues to be rude and un-trusting all the way until the secret of who she really is comes to light. What I just didn't understand is where all his hostility came from. He was extremely rude to her, finds out who she really is, says a short apology, and then treats her with respect. I don't know what I exactly wanted to happen once he realized who he kept talking down to, but maybe if Aurelia would have held a grudge against him or if his apology was more drawn out I would have been ok with it, but it was just so flippant. Lastly, the romance. This is a very "love-at-first-sight", quick romance that almost seems to come out of nowhere. If this were an everyday YA contemporary I would have had a problem with how quick their romance forms, but since it's a fairy tale re-telling sort of story, I was fine with it. It wasn't perfect, and I wished they would have opened up a little more to each other to have a better basis for loving each other, but I was still ok with their pace. I want to call this story a very sweet one, but you really have to get through the dark, evil first half in order to get to the sweetness. Aurelia goes through something awful in the first half, but she escapes. The second half of the book is where she not only finds happiness, but finds herself. I found a few issues with the book (like Crestwood's character and how quick the romance was), but they were very minor issues and I was able to look past them in order to still enjoy the book. I've never read the Brother's Grimm fairy tale that this book is inspired by, but I will say that this story had all the elements of a fairy tale re-telling. It didn't feel cheap or unoriginal, but instead felt genuine and almost true. I was just reading a story, not a crazy magical fairy tale re-telling. It was very real feeling. I would recommend this to those who love fairy tale's and fairy tale re-telling's.